Duke is the mainstay of early UK blueberry production and British grown fruit will often be found on the supermarket shelves at the beginning of July. Despite being an early season variety, it flowers relatively late, and so may miss the frosts in colder areas. 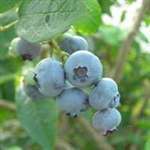 The berries are medium to large and sweet with a mild blueberry flavour when allowed to fully ripen. Duke has a strong, stocky habit with well spaced growth, but benefits from good pruning in its early years to make a well branched bush. It is also much happier when provided with adequate wood chip (or similar) mulch but is reliable and consistently productive. Arrived in perfect gift wrapped condition, so quickly! Most impressed with how quickly it arrived, thank you! Good quality plant. Excellent delivery time, well packed, no damage in transit. excellent healthy plant well packaged. Long time to deliver.